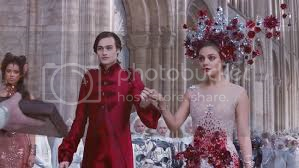 Jupiter Ascending is a science fiction movie with a Cinderella theme. The main actress Jupiter Jones is played by Mila Kunis. The role of her star crossed lover is played by Channing Tatum. Jupiter is an Earth born girl who lives life out as a parentless girl adopted by an astrologer who predicts incredible things for her because she has the sign of Jupiter rising in her charts at 23 degrees. Jupiter finds this hard to believe because she is a maid and cleans houses for a living, a very lowly job in America. I was very disappointed with the casting choices of the two lead roles in this movie. I have always loved science fiction movies for their unique, creative and forward focused thinking and it felt like they were stuck on present day ideals. It is hard to picture a place in the future in another world with the face of these two actors who show little emotion or facial expression that I have seen already in a ton of other movies. There is many talented actors that could have brought this part to life. They may be unknown but I feel like Mila did not do the part justice…If she wasn’t already famous she could never have possibly been cast into this. Channing Tatum also wasn’t wearing his shirt for most of the movie and not that I don’t appreciate men but this isn’t Magic Mike for crying out loud it didn’t make sense in the scenes where he was shirtless. Can we please see some new faces especially in science fiction? We are talking about apocalyptic annihilation of humanity and I didn’t see one tear. It was a total detachment from character; could this also be the fault of the directors? The soundtrack vibed well with the movie. It was composed by Michael Giacchino. It was set well to the scenes but does not sit well on it’s own accord. Yet it is a soundtrack that I feel like does not stick out in any sort of creative way I feel like it is the same American soundtrack I have already heard before, again a disappointment while watching a science fiction movie in which you are hoping to see some new original thinking. The display and imagery was exciting. I saw this movie in 3D and it was very interesting to watch. There is alien life, cool inventions and astronomy that is fun to look at. Also, if you are interested in beautiful things there is scenery that is breathtaking, fashion and hairstyle that is on point in this movie, it is modern, sophisticated and fascinating. The wedding dress and hair in one scene is incredible. It is designed by Kym Barrett. The setting was supposed to be the epitome of space wealth but it was hard to imagine compared to such movies as 300 and The Hobbit, I didn’t see many riches. There was a group of cliché space thugs at every turn, at every corner, on every scene, as there were three siblings fighting over the inheritance left by their mother, who was murdered. You don't figure out who the killer is until the end. (I will let you figure that one out on your own.) It mirrored every particle of human DNA in which the genetics of human survival scream at you to take take and take, so that the weaker species dies out with nothing and your genetics survive. Although they were not human species, a sort of alien species they acted exactly as a human being would. Jupiter is made three separate business offers once she realizes that she is set to inherit the Earth and much more if she could play her cards right. I am just saying if she could have been thinking of the whole picture she could have potentially saved universes and not just the Earth. It seemed like she was only interested in the Earth’s welfare even after discovering that the aliens were taking a substance that gave them more time by giving them youth that in turn cost hundreds of human lives just to make a small capsule. Jupiter is the exact genetic reincarnation of the mother and must claim her right to the throne to save Earth. This movie is about betrayal and everyone turns they’re back on each other several times in this movie and it is just a pile of predictability and unpredictability rolled into a visual journey. If you are going to the movie to see something cliché this is a good movie for you. It has everything predictable in a science fiction movie and don’t expect any great acting or anything but you can expect unpredictable landscapes and some new styles. Jupiter Ascending - Complete Soundtrack By Michael Giacchino.